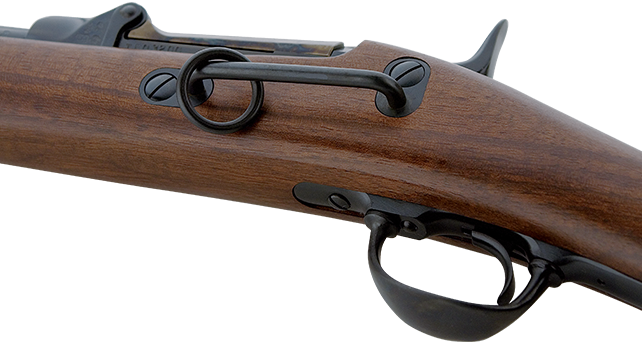 The Springfield Trapdoor Cartridge Rifle and Carbine was produced for the military in 1873. It was a redesign of the Army’s Allin Trapdoor rifle. 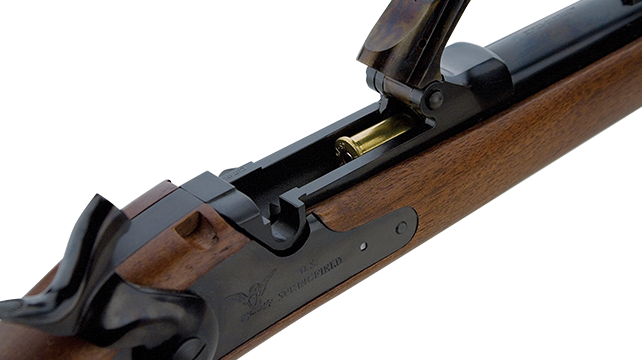 The Springfield Trapdoor held the new, more powerful .45-70 military cartridge. Full-stocked, 32 inch barreled rifles, as well as half-stocked, short-barreled carbines, were produced. With their new 1873 Trapdoor Carbines, Custer and the 7th Cavalry rode off to the Battle of the Little Big Horn and into the pages of history. The breechblock (shown from above the receiver) pivots forward for loading. Clips to a carbine sling for carrying.